Exercise is an important part of a healthy lifestyle. Exercise has many physical benefits and can also improve mental health. It is recommended that adults do moderate aerobic exercise every week. Everyone can benefit from some form of exercise. Exercise is an important part of a healthy lifestyle as it gives you the strength, flexibility and endurance needed for daily activities. Exercise is beneficial to the immune system and has been shown to improve physical and emotional wellbeing and mental health. more flexibility in muscle and joints. Exercise can also boost self-esteem, reduce your risk of stress and depression and it produces the naturally occurring ‘feel good’ chemicals, called endorphins. What are the benefits for people with HIV? Exercise doesn’t fight HIV, but it can have important benefits for people with HIV, in addition to all those listed above. Many people with HIV have increased levels of blood sugars and fats, such as cholesterol, which can increase the risk of some serious long-term health problems. Exercise can lower levels of these fats and sugars, reducing the risk of heart disease, stroke and type 2 diabetes. "Make sure you choose exercise which you enjoy so it’s easier to stay motivated." People with HIV-related weight loss, or wasting, often have low levels of a type of cholesterol called HDL; sometimes referred to as the ‘good’ cholesterol. Exercise can increase levels of this good cholesterol. Resistance training can also help people with HIV-related weight loss by increasing lean body mass. Exercise can reduce the risk of osteoporosis and help, once it is diagnosed, by encouraging new bone to grow. Regular exercise has been shown to reduce fat accumulation in people living with HIV who have lipodystrophy (changes in body fat), whilst helping to build muscle in the areas where fat has been lost. Regular exercise can also reduce the risk of some cancers developing. There are two types of exercise: aerobic and muscle-strengthening (resistance). Aerobic exercise improves your heart’s ability to pump and muscle-strengthening exercise is necessary for building and maintaining strong bones and muscles. As an adult, you should aim to do 150 minutes of moderate aerobic activity (or 75 minutes of vigorous aerobic activity) every week. One way to do your recommended 150 minutes is to do 30 minutes on five days a week. Moderate activity will raise your heart rate and make you breathe faster and feel warmer. It includes activities like walking fast, dancing, gardening and cycling. Vigorous activity makes you breathe hard and fast and it includes activities like jogging or running, swimming laps and playing football. It is also recommended that you do muscle-strengthening exercises on two or more days a week. Muscle-strengthening exercise includes lifting weights, doing exercises that use your own body weight, such as push-ups and sit-ups, and yoga. 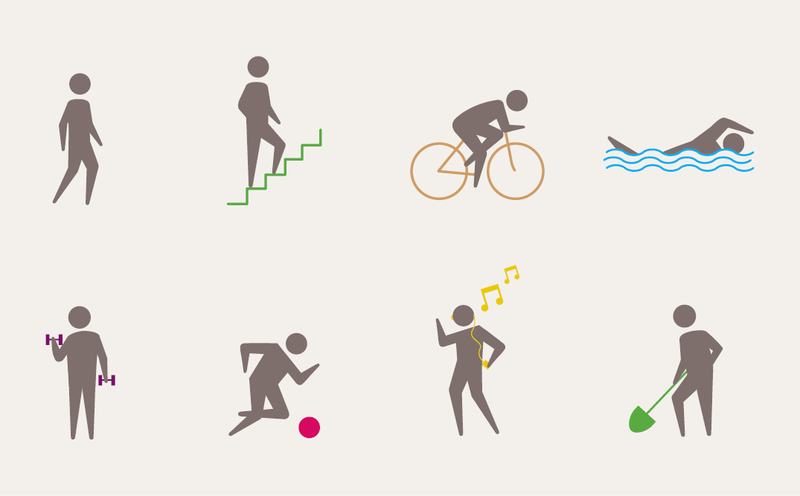 You can find out more about the amount and types of exercise recommended for adults on the NHS Choices website. Mention to your doctor that you are thinking of starting an exercise programme. They’ll be able to tell you if you need to be careful because of any medical problems, such as high blood pressure or joint problems. Think about what your aims are and set yourself some realistic and achievable goals. If you’re too ambitious you might become disappointed and lose enthusiasm for your exercise. Make sure you choose exercise which you enjoy so it’s easier to stay motivated. Many people choose to exercise in a gym. Most gyms employ fitness instructors whose job it is to ensure all exercise is carried out safely. They can also design an individual training programme for you. Make sure that you tell the person working with you about any health conditions you have that might make exercise risky, or any injuries. You don’t have to tell them that you have HIV. It is important to stay properly hydrated every day and this is especially true on the days when you exercise. As well as having plenty of water to drink before your workout begins, you should also make sure you rehydrate after you finish exercising. It's best to avoid exercising immediately after a large meal but it is important to have a light snack before exercise to give you energy for your session. Everyone’s different but snacking between 30 and 60 minutes before the start of your workout is a good idea. Do not eat during a workout but do try to eat a meal high in carbohydrate and protein as soon as possible after each session in order to promote muscle tissue growth. It might be helpful to seek advice from a registered dietitian at your treatment centre on developing a suitable diet plan. Try to prioritise exercise and make it part of your regular routine. Exercise with others – find a gym buddy or try a group class. If you join a gym, make sure you feel comfortable in it. Don’t feel intimidated – there will be members of all abilities. Listen to your body and rest if you are tired. Allow yourself regular days off as your body needs time to recover and benefit from exercise. Don’t exercise if you feel ill.
Don’t punish yourself or feel guilty if you miss a session or do less than you hoped. Remember activities such as walking or cycling to work will count towards your daily exercise, as will using the stairs rather than the lift or escalator.